Garnet is the birthstone of January. It is a beautiful stone that has been used in admiration throughout history. Colour: Found in many colours including red, orange, yellow, green, blue, purple, brown, black, pink and even colourless. The varying colours of Garnet depend on their chemical composition and are referred to as specific types of Garnet such as almandine, andradite, demantoid, grossularite, hessonite, pyrope, rhodolite, tsavorite, spessartine and uvarovite. Appearance: Garnet is a transparent stone and can have inclusions within it. Garnet’s light transmission properties can range from the gemstone-quality transparent specimens to the opaque varieties which are used for industrial purposes such as abrasives. The mineral’s luster is categorised as vitreous (glass-like) or resinous (amber-like). Rarity: Garnet is not considered a rare gemstone, it is found in many places around the world. However, blue garnet is the rarest - only discovered in the late 1990s in Madagascar. This stone changes colour from blue-green in the daylight to purple in incandescent light. Because of their colour changing quality, this kind of garnet is often mistaken for Alexandrite. The green Garnet is also more rare - normally sourced from Gold-Bearing lands. Moh's Scale Hardness: Ranges from 6.5 to 7 depending on the type. For example, almandine, pyrope, spessartine, and tsavorite are on the harder side while demantoid is a bit softer. Garnets are stable to light and chemicals however they can be attacked by hydrofluoric acid. It is recommended that this gemstone is cleaned with warm soapy water. Sourced: Scotland, Russia, Madagascar, Arizona, Argentina, Brazil, Australia, South Africa, Burma, Switzerland, Sri Lanka, Germany, Italy, Finland, Mexico, Pakistan, Tanzania, Kenya. All of the Garnets share a common chemical structure but vary in their chemical composition. Garnet is commonly found in highly metamorphosed rocks and in some igneous rocks. They form under the same high temperatures and / or pressures that form those types of rocks. Garnet is used by geologists to gauge the temperature and pressure under which a particular garnet-bearing rock formed. Garnet is also found in the rocks of contact metamorphism, subsurface magma chambers, lava flows, deep-source volcanic eruptions, and the soils and sediments formed when garnet-bearing rocks are weathered and eroded. This stone has been used throughout history in jewellery and other decorative adornments such as windows in Churches and Temples. Greek philosopher, Plato even had his portrait engraved on a slab of Garnet by a Roman engraver. Bohemia, was once a tremendous source of Garnet, and at one time, cutting, polishing, and mounting garnets was a very rich industry in that country. Many Bohemian castles and churches had magnificent interiors decorated with Garnet. Bohemian garnets are famous even today, known for their small but beautiful stones set close to each other resembling a pomegranate. 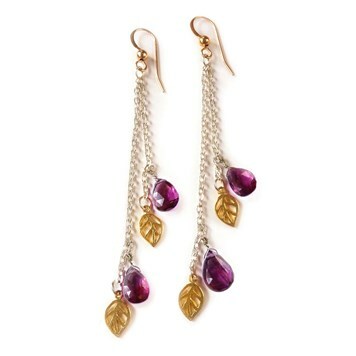 The name Garnet may derive from the Latin 'granatum' - meaning pomegranate. Garnet jewellery with the stones still arranged in the traditional, tightly joined way is still found in the Czech Republic. The Anglo-Saxons were also fond of garnets and their jewellery was set with garnets mounted in many forms. Garnets were highly popular in Europe in 18th and 19th centuries. They were frequently used for jewellery in the Victorian times. 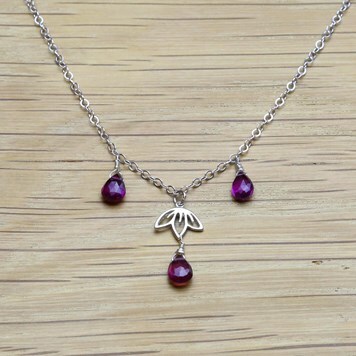 In Old Spain, the pomegranate was a favourite, and as a result of this, so was the garnet. In Spanish astrology, the garnet once represented the sun. Garnet is believed to have many spiritual properties . It is said to revitalises, purify and balance energy, bringing serenity and or passion as appropriate. Garnet is also said to inspire love and devotion as well as alleviate emotional disharmony. It has been known as the stone of commitment - There are many antique engagement rings that contain Garnet for this reason. The birthstone of January is also thought to strengthen the survival instinct, brining courage and hope to seemingly hopeless situations. Hessonite Garnet: Believed to impart self-respect, eliminate feelings of guilt and inferiority. Rhodolite Garnet: Said to be be a warm, trusting and a sincere stone that stimulates contemplation, intuition and inspiration. Red Garnet: Thought to represent love - it revitalises feelings and enhances sexuality. The January birthstone is said to regenerate the body and stimulate the metabolism. Garnet is thought to regenerate spinal and cellular disorders. It is said to purify and reenergises the blood, heart and lungs. Garnet is one of our most popular stones here at Kernowcraft. To ensure that we have a variety to choose from we stock the stone in a number of shapes, sizes and cuts. This includes cabochons, faceted top cabochons, faceted stones, briolettes and beads. We also have a number of different varieties including Rohdolite Garnet. 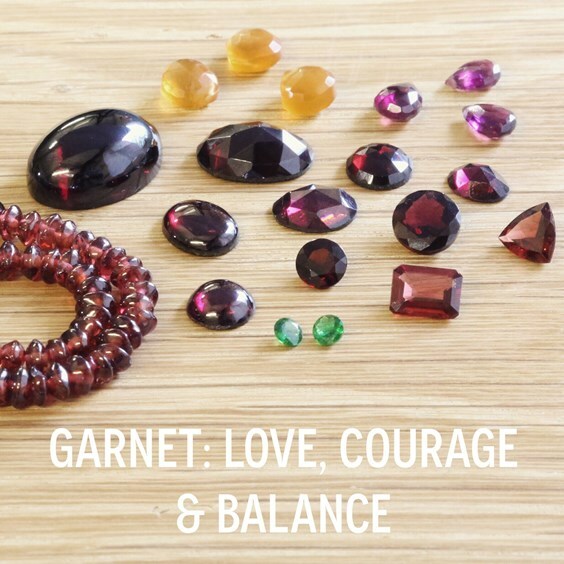 You can shop our full range of Garnet HERE. Within our Make The Look section we have a number of jewellery making projects using Garnet. For example the two beautiful designs on this page. We think you will agree that garnet has an elegant and classy look and we have tried to reflect this in our project designs. Both are easy to create - all you need is a few tools and basic wire wrapping skills. Either one would make a personal and thoughtful birthday present to anyone whos birthday lands in January. For more information on how to wire wrap a gemstone briolette CLICK HERE.